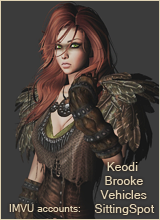 IMVU has always had it's share of roleplay settings - medieval rooms, kingdoms, elves and vampires of various franchises and epics for example. But what do you actually wish to see more? Re: Any roleplay setting that you wish to see more in IMVU? Well, for me it's not really anything specific- I would, however, like to see more people exercise their creativity with roleplay settings. Like mixing genres, or putting new spins on old favourites. A desert trading camp rather than a tavern, or a seaside port where mer-folk peddle lost treasures to travelers, rather than another kingdom. Maybe more historical RP rooms that aren't medieval- a 1920's gangster RP wherein there's a surreal twist of some sort, or a non-evil circus RP that focuses on people and creatures with fantasy powers, perhaps in France in the 1800's. There are so many things that could be done with IMVU as a base to build from- right now we're only tapping the surface. I've never role played in my life but your suggestions sound fascinating!